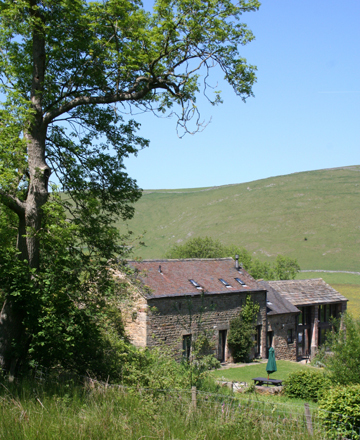 The Haybarn Studio is able to host a range of activities including art courses and environmental workshops, social (extra space for gatherings in conjunction with booking of both barns), education and training events with access to the 50 acre upland farm set in the upper Dove Valley in the Peak District with richly varied habitats including ponds, woodland, meadows and wetland as well as the upper reaches of the river Dove. Whether for fun, invigoration, creativity, education or leisure in a setting dedicated to low impact living and biodiversity, you should find this a very adaptable space for your event: something out-of-the-way and out of-the-ordinary. The upper meeting room (4mx 7.5m) seats up to 16 board room style, or can be arranged for arts activities etc. The ground floor offers a fully equipped kitchen for those who want to cater for themselves. The adjacent area (4mx 5m) can be set out for buffet lunches for up to 16 people or board room style meetings for up to 10 people. This room can also be set out for arts activities etc. You can also hire the adjacent Dove Valley Centre if you wish to organise a residential course. (sleeps up to 12). If you hire the adjacent accommodation then we offer the Studio at the discounted charity rate. The use of the kitchen and coffee,tea & milk is included in the price. We can offer home made refreshments using food that is local/ organic/ Fair-trade where possible.